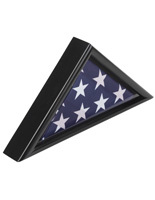 This black shadow box stand is a display case constructed of pine wood, with a grooved decorative pattern, that complements the 3’ x 5’ triangular military flag display case for sale on this site. This medal holder elevates and draws attention to a memorabilia collection stored in banner frames. This shadow box stand, also known as a display case, features a flat surface and a subtle wood grain finish for showing off a military ensign collection, for example. This simple wood fixture for a medal collection works mounted on a shelf, countertop, or mantel without detracting from the exhibit. 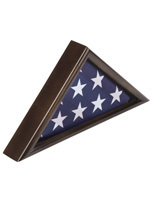 This shadow box stand for commemorative memorabilia is affordable, but not at the expense of quality and style.